Hana - The Dolmen models used to make the various sites are her work, based on screenshots from ESO. Added 3 dolmens to Solstheim. Updated meshes to SSE format. Fixed a missed water data update. In 2E 582, Molag Bal launched an all out invasion against Nirn. His aim was to merge Nirn with Coldharbor in a cataclysmic event that came to be known as the Planemeld. This was accomplished through the use of numerous Dark Anchors, or Dolmens, scattered around Tamriel (and presumably elsewhere too) that were to physically drag Nirn into Coldharbor. It was only through the heroic actions of one known as The Vestige that Molag Bal's plans were thwarted and all of Nirn saved from a gruesome end as soulless slaves. Though history does not record these events, the ruins themselves have survived. Adventurers have to this day reported many are guarded by daedra, others by the undead, and some by unnatural abominations of the wilds. 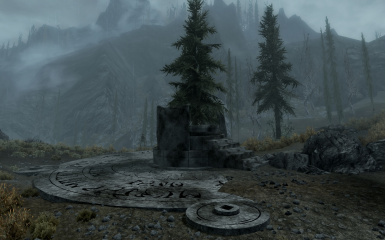 This mod aims to bring a bit of ESO lore to Skyrim by adding 12 inactive Dolmens around Skyrim, all in relatively remote areas. This is primarily just for show but several have enemies to fight as well so you can use them to acquire some of the harder to find Daedric ingredients. 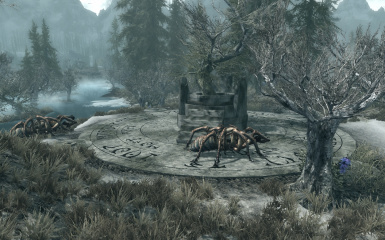 Explore Skyrim, and you should run into them soon enough. Don't be lazy, go out and look! Skyrim Special Edition 1.5.39 or greater. Drop the Dolmen Ruins.esp, Dolmen Ruins.bsa, and Dolmen Ruins - Textures.bsa files into your Data folder. 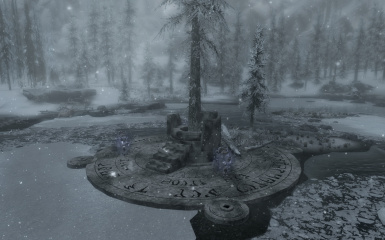 To remove the mod: Delete the Dolmen Ruins.esp, Dolmen Ruins.bsa, and Dolmen Ruins - Textures.bsa from your Data folder. Then reload your game as usual. Should be compatible with most other mods as the areas touched are pretty remote. 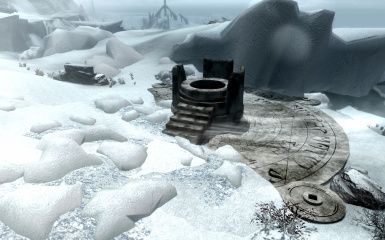 MadCat221 - LOD meshes for use with DynDOLOD.